A Simply Chocolate exclusive! Famed Knipschildt Chocolatier combines their most sought after Signature Collection Chocolates and Dark Chocolate & Caramel Sea Salt Bonbons in this artisan tower handsomely tied with a sleek brown woven ribbon. These amazing hand-painted premium chocolates in intriguing avant-garde flavor combinations will be sure to especially impress those who know and love fine chocolate. Famed chocolatier Knipschildt blends just the right combination of sweet 'n salty and luscious dark chocolate in these exquisite bonbons. These decadent chocolates are made with 71% Ecuadorian single bean dark chocolate bonbons, filled with "burnt" caramel and topped with Hawaiian sea salt. Award winning Knipschildt Chocolatier has created these bonbons for those who crave luscious, creamy, premium dark chocolate. Decadent 71% Ecuadorian single bean dark chocolate surrounds the coveted centers made with rich dark chocolate, heavy cream, sugar, and butter. 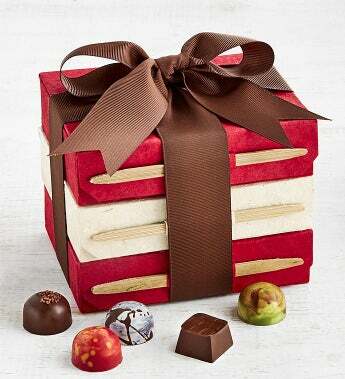 These amazing bonbons are beautifully presented in a unique sustainable keepsake box.